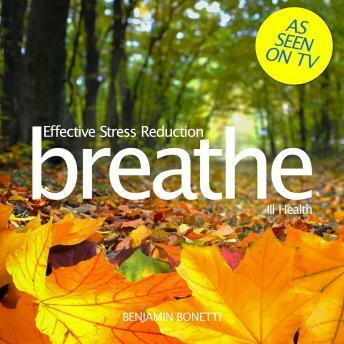 ‘Breathe’ is a range of highly effective meditation audios that assist in the control, release and management of Anxiety, Confidence, Relationships, Sleep, Stress and Weight Loss. Designed by Benjamin Bonetti, International Best-Selling Author of “How To Stress Less”, this range of personal development audiobooks utilise a number of his specialist cognitive tools to rationalise triggers, forgive the past and set a new vision for the future. Note: The Meditations from Benjamin Bonetti are not suitable for under 18s. Do not use if you suffer from epilepsy, clinical depression or any other nervous or psychiatric conditions, or whilst driving, exercising, operating machinery or taking alcohol or drugs. If in doubt, seek medical advice.